It depends on your role in the group whether you can access / change certain functionalities that you see in the screenshots and that are described in the text. The group homepage is the central space for a group. There you can get a quick overview of the group and reach all the places that you wish to take a look at in a group. You see a few things per default on the group homepage. The items displayed on the group homepage do not only depend on the default settings but also the options chosen when the group was created. When you are a member in the group, you see your status and whether you can leave the group or not. When you are an administrator of the group, you see the Edit and Delete buttons. If the group administrator allowed group members to recommend the group to friends, you see the Recommend to friends button. If the group administrator allowed users to invite friends, you see the Invite friends button. Group navigation: You see all the areas that you have access to in the group. If you are not allowed to edit pages, you will not see the “Share” tab, for example. Group characteristics: Important group attributes, e.g. open or request group, possibility of having submissions etc. Group administrators: Click on their names to view their profile pages. Group category: Category to which this group belongs; great for filtering groups on My groups or Find groups. Created: Creation date of the group. Editable: If the group administrator defined a time frame within which group content is only editable for group members, it is displayed here. If the group administrator did not set a start and / or end date, this setting will not be shown. Statistics on the number of group members, pages, files, folders, forums, forum topics and posts. Latest forum posts: A list of the most recent forum posts and a link to the forums. Group pages: A list of group pages that have been created in the group. If you are allowed to copy a group page into your own portfolio, you will see the Copy page button next to that group page. Pages shared with this group by others: View pages that members have shared with the group. Submit a page or collection to this group: If the group allows page or collection submissions, select the page or collection that you want to submit for assessment / feedback. You do not have to share the page or collection with the group. The administrator (and tutor) can view the page or collection once it has been submitted. Members: A list of select group members and a link to the full list if the group administrator did not hide the group membership. If you are a group administrator, you can put other blocks on the group homepage. Check the blocks in pages context for a list of them. Invite multiple users to the group at once or add multiple users in bulk if it is a controlled membership group. Search for group members by putting their name in the search box and then clicking the Search button. You can combine the name search with the sorting options that follow. Change the role of a user. Remove a user from the group. Decide how many members shall be shown per page. If you are a regular group member, you are not able to invite or add people from the members page, and you cannot change the role or remove a user from the group. A group administrator can always invite any user to a group from the Members tab by clicking on the link send multiple invitations at once. If the group administrator allowed users to invite friends, they can do so via the Invite friends button on the group homepage. Potential members: Select the users you want to invite to the group. If you are a group administrator, you see all users on the site. If you are a regular group member, you only see your friends. Search: You can also search for users in the search box if there are too many names listed. Add the users to the list Users to be invited by clicking on the right-arrow button . Then click on the left-arrow button , and they are removed from the list. When you have all the users you wish to invite to this group, click the Submit button. The invited users will receive a notification. The group will also be listed on the users’ My groups page where they can accept or decline group membership. You can also double-click on a name to move it from one side to the other. If the group administrator allowed membership recommendations when creating or editing a group, group members can recommend the group to their friends by clicking on the Recommend to friends button on the group homepage. Potential members: Select the friends to whom you want to recommend this group. Search: You can also search for your friends in the search box if there are too many names listed. Add the users to the list Users who will be sent a recommendation by clicking on the right-arrow button . If you put a person into the box for recommendations by accident, you can remove them from that list by clicking on them. When you have all the users to whom you want to send a recommendation, click the Submit button. The users will receive a notification and can then decide to join the group. The forums are visible to all group members. If you create a public group, anybody online will be able to see the forum discussions. However, they would need to log in to participate. Forums in public groups receive an RSS feed to enable users to subscribe to the discussion forum, e.g. 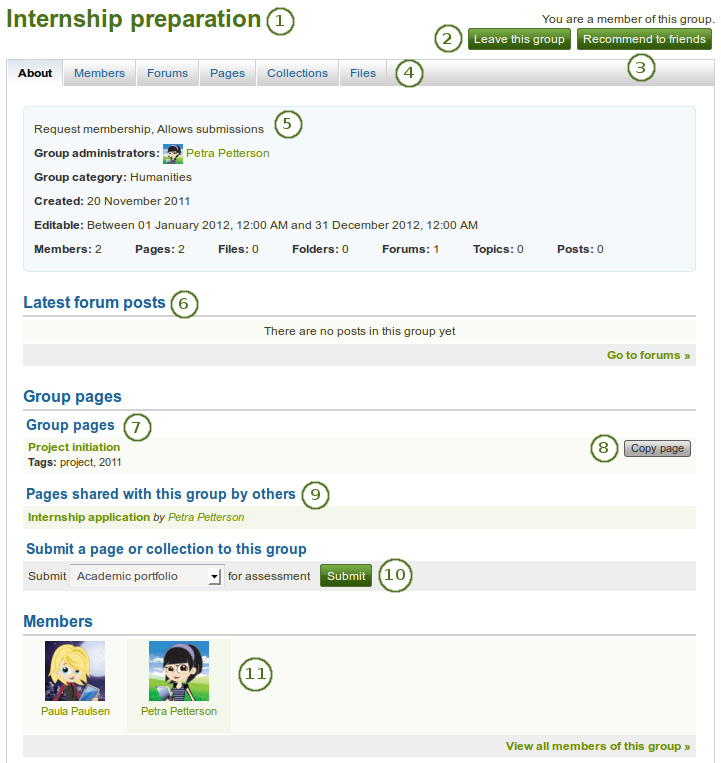 the mahara.org community forums. If you have appropriate rights, you can create a new forum by clicking on the New forum button. Forum: Name and brief description of the forum. 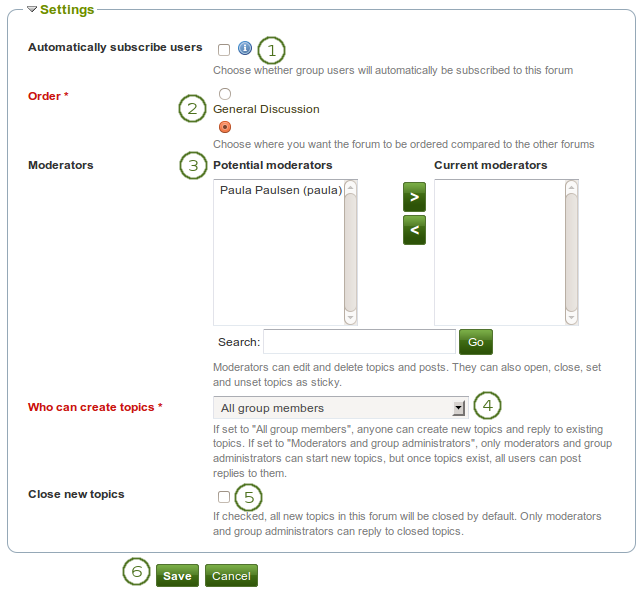 Moderators: View the forum moderators (if appointed). Group administrators: View the group administrators. Topics: Number of forum topics in each forum. If you want to receive notifications about new forum posts, you can subscribe to a forum via the Subscribe button. If you already receive notifications, you will see the Unsubscribe button to have the option to not receive updates anymore. If you are a group administrator, you see the Edit button for making changes to the forum settings. If you are a group administrator, you see the Delete button for deleting the forum and all its topics. A group administrator can set up forums in a group. Click on the New forum button to set up a new forum. Title: Give your new forum a title. Description: Write a brief description of your forum. This will appear when the forum is listed under the Forum tab making it easier for users to decide whether they want to look at it or not. Forum indent mode: Specify how the topics in this forum should be indented. Fully expand: Indentation is used to indicate the replies to individual posts. There is no limit to the level of indentation. Expand to maximum: Indentation to indicate the replies to individual post specifying the maximum level of indentation (pops up once this option is chosen). All replies beyond the chosen level are not indented further. No indents: There is no indentation of replies to individual posts, but the forum structure is flat. Click the Save button to make these changes or continue on to the Settings. Besides these basic settings, there are additional ones that the administrator can decide on. Automatically subscribe users: Choose whether group users will be subscribed to this forum automatically. When subscribed, users will receive notifications when new posts and replies are made in the forum. Users will have the option to unsubscribe if they do not want to be notified. Order: A default position for your forum is chosen upon its creation - after the last existing forum. Here you may position it elsewhere in the list of forums. Click the radio button above or below a certain forum to position it before or after it. Moderators: Choose one or more moderators for your forum. They can edit and delete topics and posts as well as open, close, set and unset topics as sticky. Thus, they can perform some administrative functions without having to receive full group administrator rights. Select one or more users from the list of Potential moderators on the left or search for a person. Click the right-arrow button to add the user(s) to the Current moderators. To remove a moderator, select the user in the Current moderators list on the right and click the left-arrow button to remove this user. 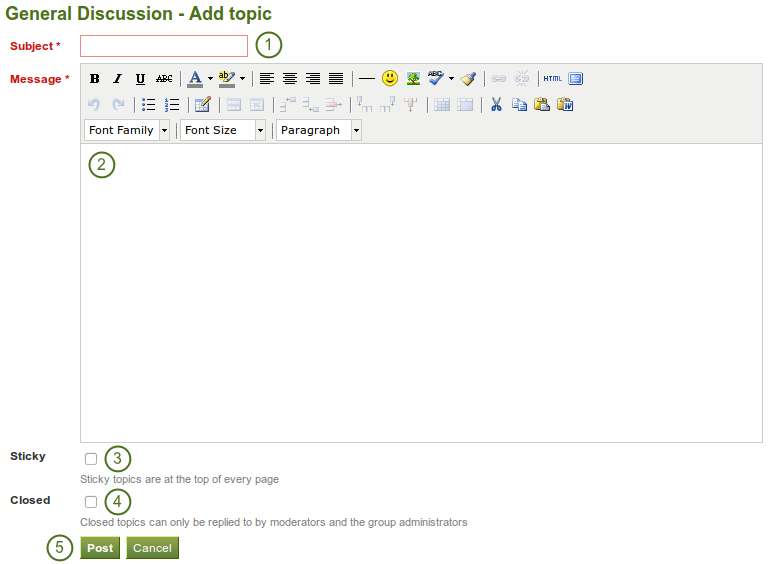 Who can create topics: Decide who in your group is allowed to create topics within a forum. If set to “All group members”, any group member can create new topics and reply to existing topics. If set to “Moderators and group administrators”, only moderators and group administrators can start new topics, but once topics exist, all users can post replies to them. Close new topics: If checked, all new topics in this forum will be closed by default. Only moderators and group administrators can reply to closed topics. This is a setting that may be useful for a forum that is solely used for announcements. Click the Save button to save the settings for the forum or use click the Cancel button to retain the previous settings. When you have the right to add a forum topic, you see the New topic button when you click on a forum. An administrator also always has the buttons Edit forum and Delete forum available to make changes to the forum set up. Subject: Type a concise description of what you wish to discuss in this forum thread. This field is mandatory. Message: Elaborate on the topic. This field is mandatory. Sticky: Administrator-only setting to keep the topic at the top of the list of forum topics in the current forum. Closed: Administrator-only setting to prevent others from responding to this post. Moderators and administrators can still post replies. Click the Post button to send off your discussion topic, or click Cancel to abort your action. When you write your forum topic, i.e. your first post, and any other subsequent post, you have formatting options at your hands in the visual editor (when it is enabled). It also allows you to insert images into your post. However, you should not copy the URL of one of your images from your Files area. This image is only displayed to you unless it is also included in a page that you made available to this group, logged-in users or the public. Permissions on artefacts are governed by the permissions set on the page(s) in which they are included. In some groups you may be able to upload files into the group thus allowing every group member to see the file. You could link it then in your forum post but must be aware that any group member could delete the image. Once you have finished writing your forum topic, it is displayed in the list of forum topics. Others can see it immediately. The administrator and moderator of the forum can edit or delete a topic at any time. Regular members can edit their topics up to a certain number of minutes after writing the post. The site administrator defines that time in the forum post delay. The title of the forum. The title of the forum topic. The profile picture and name of the person who wrote the post. The name is linked to the profile page. The number of posts of this person in all groups. The date and time of the forum post. The Reply button to comment on the post. The titles of subsequent posts are clickable and give you the link to this post. That allows you to jump to this post directly and view it at the top of the page. If you are the author of a forum post, you see the Edit button and can make changes to your post at any time. Group administrators and forum moderators can always edit and delete any forum post besides replying to it. The person starting the forum topic and the group administrator as well as forum moderator have the Edit topic button to make changes to the initial post. Group administrators and forum moderators can also click the Delete topic button to delete this forum thread. If your forum topic has more than 10 posts, the posts are paginated and 10 posts per page are shown. You can jump to other posts in the topic by clicking on a page number. There are no notifications sent when you edit or delete a forum post. If you wish others to know about your changes, you should write a new post instead of editing an existing one. Everybody can reply to a forum topic or other posts therein unless the moderator or administrator had closed the topic. The replies are intended to make it easier to see to which comment you reply except in forum topics that do not use indentation. Click the Reply button below the forum post to which you wish to reply. The forum post that you are replying to is displayed beneath your reply window making it easier for you to refer to it if necessary. Subject Set a different subject if you want to by clicking on the link Click to set a subject. This is most often not necessary and usually only used if the topic evolves into a different discussion. However, in such cases, usually it is good to open a new forum topic instead. Click the Post button to save your response or the Cancel button to abort your forum post. Once you have saved your post, you may have time to edit it before it is sent to the forum subscribers. That depends on the site settings for the forum post delay. If you can edit your post, you see the Edit button. 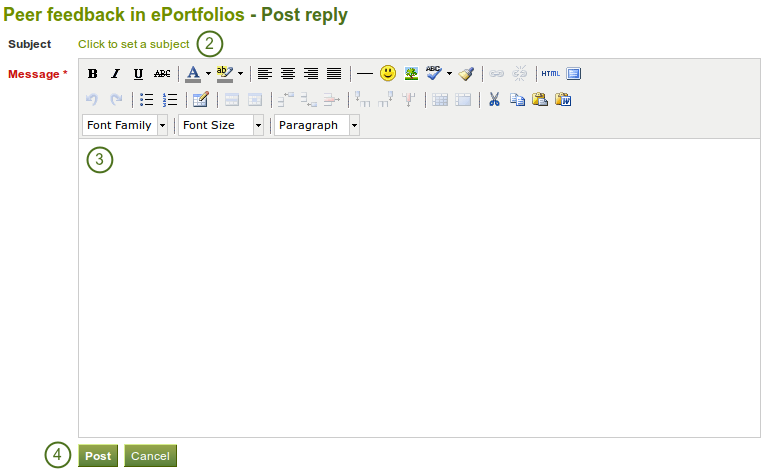 In the edit window, you also see how much time you have left until your post is sent. When you, but also a moderator or an administrator, edit your forum post after this time, it is stated when and by whom the editing was done under “Edits to this post”. A moderator or administrator can always edit or delete a single forum post, a topic or an entire forum. Once a forum post, topic or forum is deleted, this action cannot be reversed and the content is gone forever. 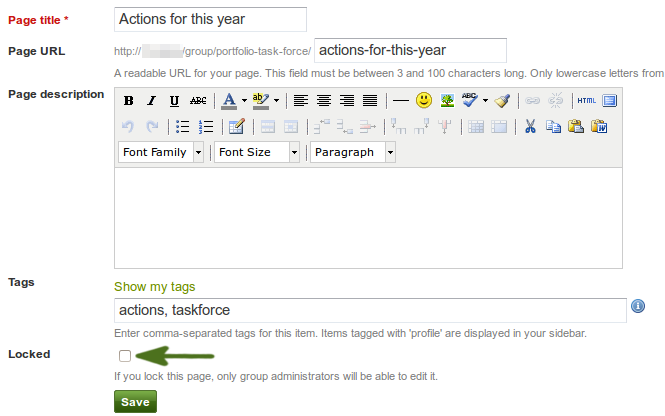 Group administrators and forum moderators can perform bulk actions on forums in a group. Select the topics for which you want to perform the same action. sticky: They will sit at the beginning of all other forum topics. unsticky: They will be placed into the correct chronological order of their last post. close: Only the group administrator and forum moderator can add posts to these topics. open: Everyone can post to these topics again. Click the Update all selected topics button to save your changes. The latter are pages that users make accessible to the group from their personal pages by sharing them with the group. Members of the group cannot edit these pages. Depending on the group settings, either only administrators (and tutors if it is a controlled group) or also regular group members can create and edit group pages. Everybody who can edit a group page can add or delete blocks on that page. There is no version tracking that shows who has edited what. Users should trust each other when collaborating on pages together. Otherwise, it may be better if they only shared pages with a group. The group homepage can only be edited by the group administrator. It contains a number of default blocks. You can add more blocks to it to customize the page for the group. Please refer to the overview of blocks for a list of all the blocks that you can use on the group homepage. Creating, editing and sharing a group page is very similar to creating, editing and sharing a portfolio page. Not all blocks are available when editing a group page in the page editor though due to the different context. Please refer to the overview of blocks for a list of all the blocks that you can use in a group page. When you leave a comment on a group page, only group administrators (and tutors if it is a controlled group) can delete feedback on pages. 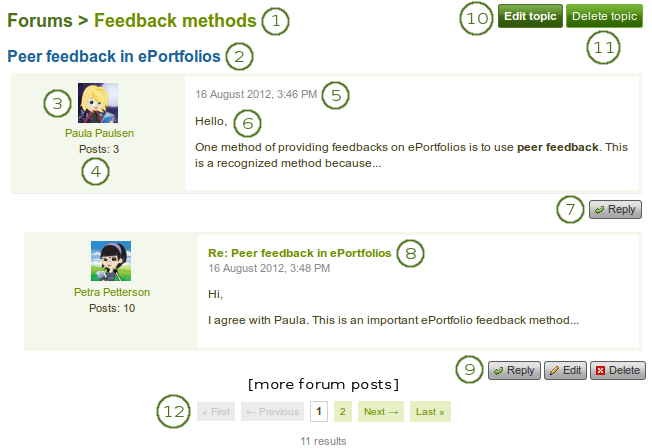 For submitting a page to a group to receive instructor feedback, please refer to the feedback section. Similarly to group homepages and users’ portfolio pages, group pages can also have human-readable URLs if the site administrator activated clean URLs. When you create or edit a group page, you can decide whether only the administrator shall have the right to edit the page. With this setting you can allow the general editing of pages in the group, but still be able to lock down certain pages. Depending on the group settings, either only administrators (and tutors) or also regular group members can create and edit group collections. Everybody who can edit a group collection can add or delete pages and content in them. There is no version tracking that shows who has edited what. Users should trust each other when collaborating on pages and collections together. Otherwise, it may be better if they only shared pages and collections with a group. The adding, editing and managing of group collections work like in your personal porfolio collections. If you are allowed to edit pages and collections in a group, you can see the Share tab. The sharing of pages and collections work like in your personal porfolio. The group in which the page or collection was created is added automatically to the access permissions. The Files area in a group holds all files that are uploaded by group members who have the permission to do so. The uploading process works like the one in the personal files. The site administrator can set a group file quota to restrict unlimited uploading of files. The group quota is displayed in the sidebar when you are in the Files area. When you have the permission to upload a file, you can also determine additional permissions of who can view the file and edit its metadata. An administrator has all rights, but you can restrict them to regular group members or tutors. View: You can see the file in the group files area and add it to a page. 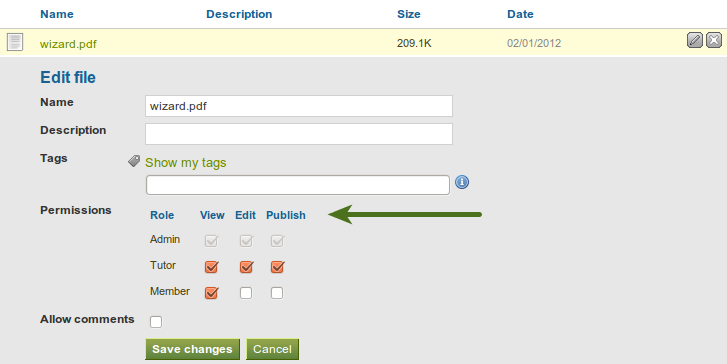 Edit: You can edit the file name, description, tags and permissions. Publish: You can include a group file in your personal portfolio pages. The owner of / group member uploading a file retains access to the file even if other group members are not able to use the file. When you are an administrator of a group, you can switch on the participation report in the group settings. The report provides you with information on who commented on what pages that were created in or shared with the group. Pages shared with this group: List of all the pages that people have shared with this group. Shared by: Displays the author of the page. 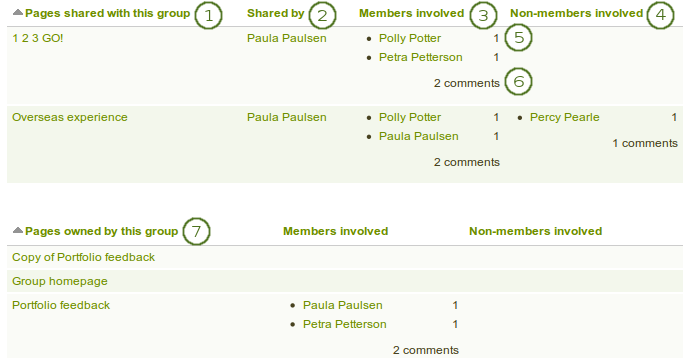 Members involved: Shows the group members who have commented on the pages publicly. Non-members involved: Schows the users who have commented on the pages publicly but are not members of the group. Next to each person who commented on a page is the count for the number of comments they have left on that page. The total count for the comments by members and non-members is displayed. Pages owned by this group: List of all the pages that were created within the group. You can sort each of the columns.